A real minor man-made miracle in Jerusalem. A few days ago two papers published in Nature suggested that the Anthropocene (The Age of Man) epoch began in 1610. This is the latest in a number proposals as to when this period of the Earth’s history that begins when human activities have had a significant global impact on the Earth’s ecosystems started. I can be much more certain when my ‘Age of Running’ began. 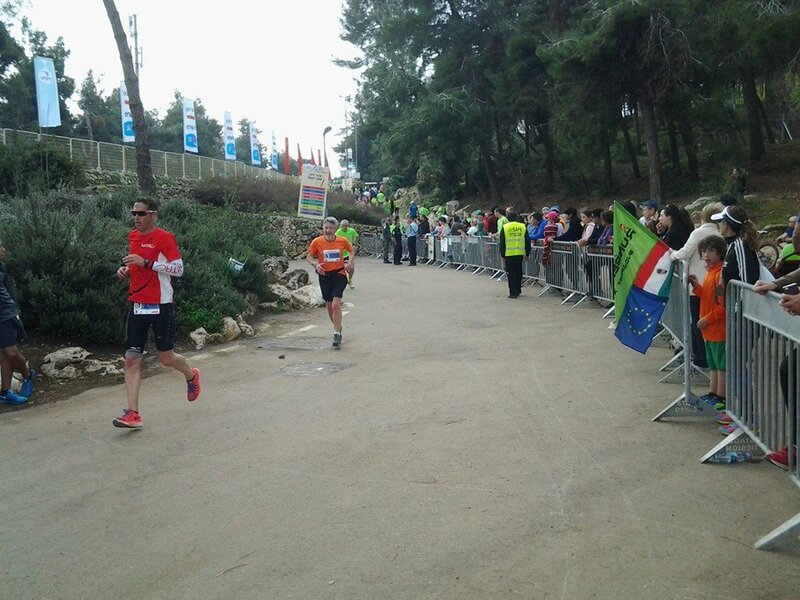 It was at 09.00 on 1st March 2013, and in Sacher Park, near the south-east corner of The Knesset in Jerusalem. 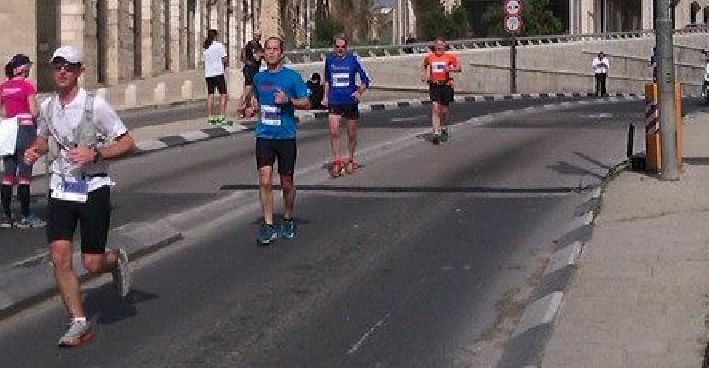 There I started the Jerusalem Half Marathon, the beginning of regular, often monthly, half then full marathons. 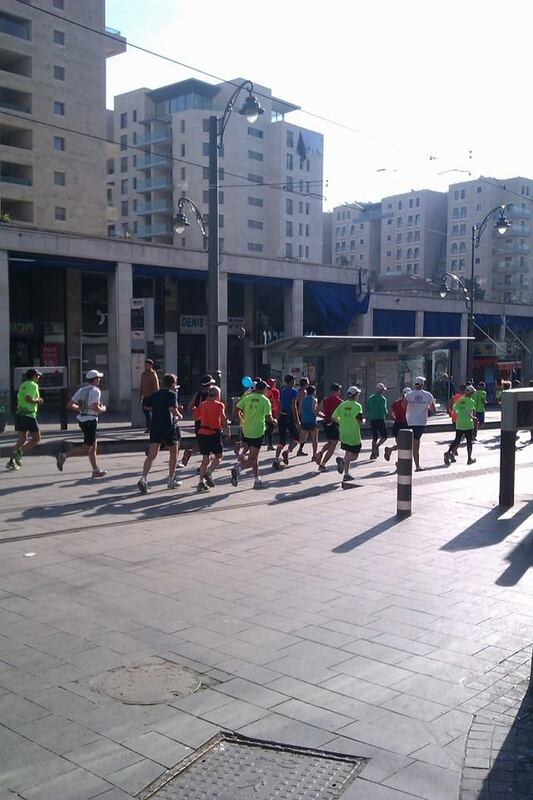 2 hours and 5 min later I was certain there would be many more races, but NOT in Jerusalem again. The hills on the half marathon were bad enough, why would I want even more on the full distance. 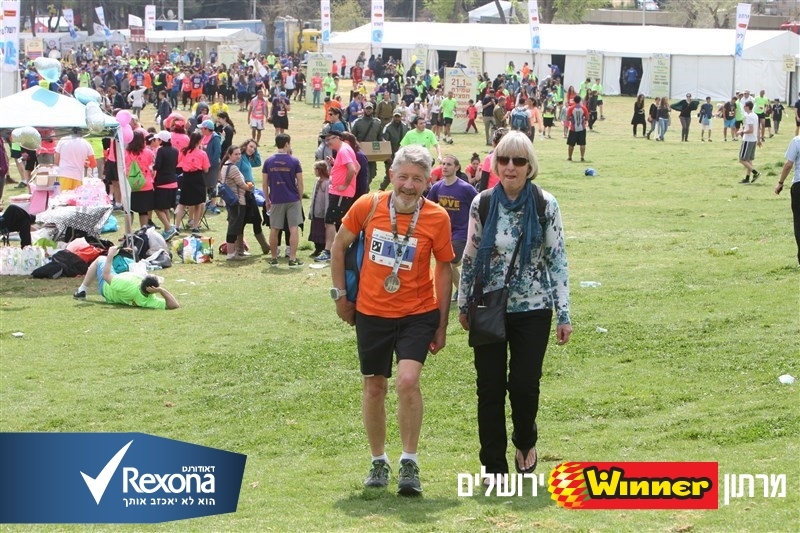 Wind forward just over 2 years and there I was, together with more than 1000 others, on the starting line for the 5th annual Jerusalem Marathon. 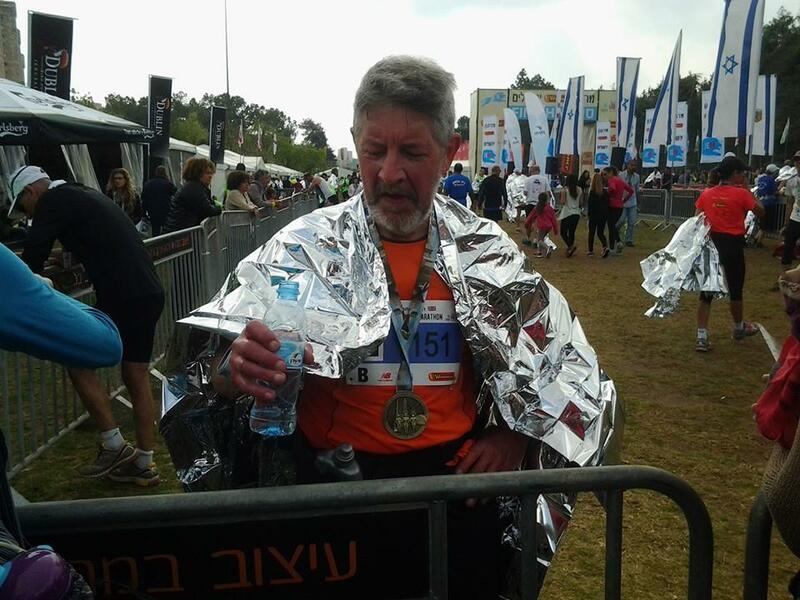 I really had no choice in the matter, a tough hilly course was much more preferable than waiting until the Autumn for the next possible ‘J’ marathon, and this would have ended up adding an extra year to my project. I did have four months after Istanbul to prepare for it, so plenty of hill runs, both on road and the North Downs Way plus the 30 miles Winter Tanners in early January should have prepared me for this challenge. I never find marathon expos particularly exciting places, I don’t buy anything there as I take everything I need for the race with me; there aren’t usually stands with details of other races that I haven’t heard of (but I did praise the Düsseldorf marathon at their stand) and rarely are there useful/any freebies. But I do like the whole buzz of being at them, mingling with like-minded people (ie runners!) and seeing if I spot anyone in the t-shirt of a race I have done to to start up a conversation (I always wear the one of my most recent marathon). I did almost get filmed as I followed the Ethiopian and Kenyan teams into the expo, there runners, not surprisingly, filled to top places in both the men’s and women’s events. 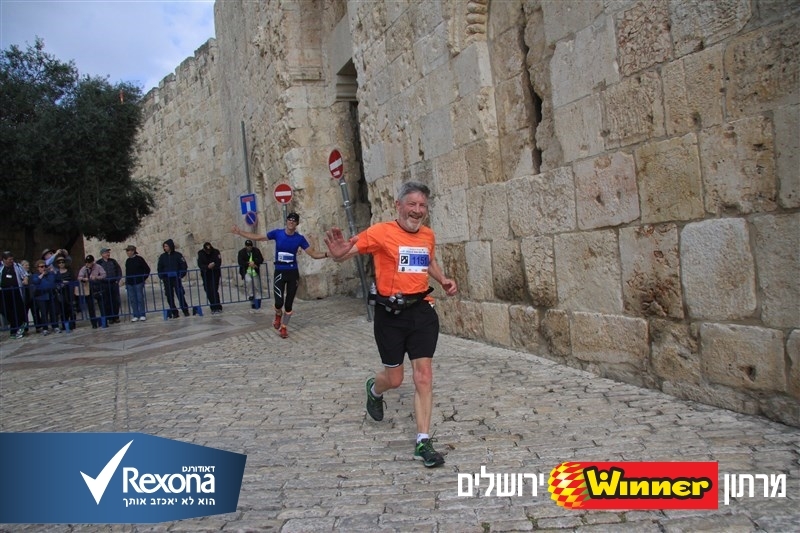 I next saw them before the start where they were keeping loose and warm in the elite area wearing gold thermal blankets and then as they ran down from Mt Scopus as we were on the way up. But what I did like about the expo was that the pasta party was included in the race entry ($55 = £37) and they provided a gluten free option. (As a comparison Edinburgh charge £22 for their carbs and comedy event, and the race is £44). There was an extensive range of carbs (pasta, rice, bread) with many possible sauces, fruit vegetables and desserts (unfortunately none of these were gluten free) and a band. Because of the early race start the 22.00 close seemed a bit excessive. The walk from my apartment took about 20 minutes, As I crossed Jaffa Road there was no one else in sight and the trams were not running because of the race but on Beit Ya’akov two other people, clearly runners, were in view; as usual for these early start marathons the only people around are other runners or race marshals/officials/police. As I joined more major roads the numbers increased and I did not have to worry about navigating to the changing area/bag drop. As this was in the shade, and quite cold, I sat around undercover in the changing area until about 6.45 before the ‘compulsory’ toilet visit and then walk few 100m walk round to the start. I was in the B starting pen, but there were no real controls or checks as to who was there although there was an actual barrier before the A/elites area where there was a lot of empty space. We set off at 7am with bright sun and a clear blue sky, a bit of a concern as to what it might be like hours later (fortunately cloud appeared then). I was near the front of my stating pen and I knew the 3:45 pacers were very close behind and I had it in mind to try and stay with them. In fact it wasn’t until the 10k mark that they moved past me, just before the corner where I knew my wife would be waiting (assuming she hadn’t gone back to bed after I had left the apartment at 5.45am; she hadn’t). It wasn’t too difficult for me to increase my pace ever so slightly and stay with them. In fact I was with them for more than the next 20k, the group tended to move ahead of me up the hills but I easily caught them going down. 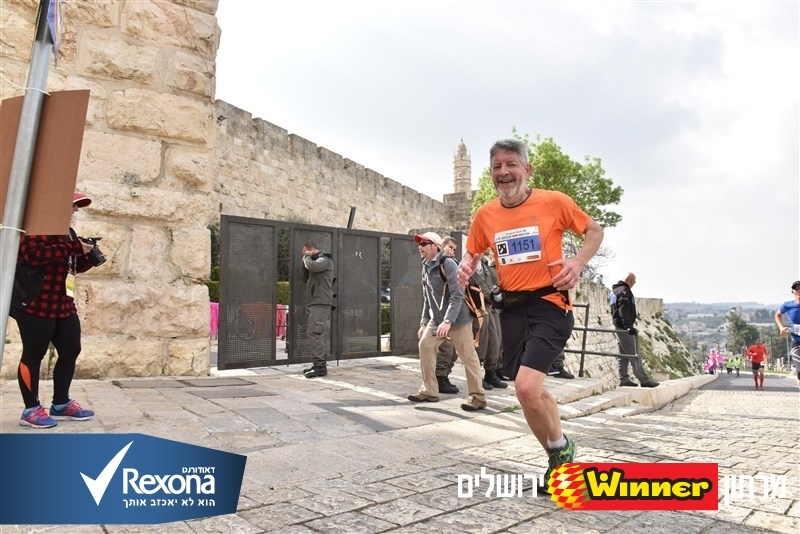 After running past the Old City we made our way up Mt Scopus, the highest part of the course with stunning views out towards the Dead Sea, although like me most didn’t stop to look. The half-way mark, where Marion was waiting, came just before we entered the Old City via Jaffa Gate for a short distance before leaving at Zion Gate. Then it was up Mt Zion, another considerable climb. I had chatted to someone who had studied the course well before going to the start, a sting in the tail at 38k was mentioned, and it didn’t disappoint! The almost km long hill gradually increased in steepness, finishing at 10%; and of course what went up had to go down and at times it was too steep, with a more than 12% downward gradient at one point, to run as quickly as I would have liked. And the final 1.4k was also upwards, again reaching a gradient of more than 10% before a short tunnel brought the finishing line into sight. I did keep going, not walking a single step. Marion was there as I crossed the line and I saw the 3:52:36 it had taken to complete the 42.2k (as has become usual I don’t look at my watch at all during the race, so didn’t have a real idea what my time was going to be). I had secretly hoped to break 4 hours but had no real expectation of doing this. So to end up just 1 minutes outside my Istanbul pb really was my modern miracle, proving that the hills work I had concentrated on during the 4 months since that previous marathon had worked. 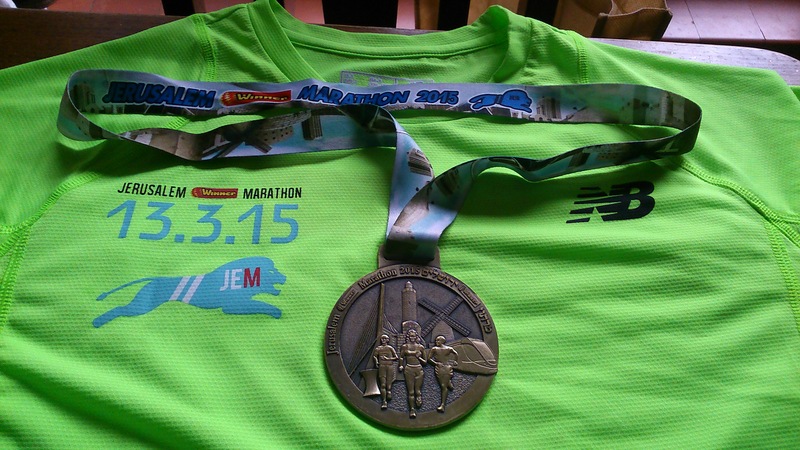 So I now have another very bright marathon technical top, a substantial medal and my 4th sub 4 hour result. But I also have a bit of a problem. At the finish of every other marathon I have been 100% certain (without the intervention of unforeseen circumstances) where the next one will be. But I already have a foreseen circumstance for my next. I have the registration, flights and accommodation booked for Kharkov in mid-April. For those of you that don’t know, it is in eastern Ukraine, very close to the Russian boarder nearly 300k of north Donetsk. You see the problem. Krakow is a week later,which might seem a good, very sensible alternative but brings ‘rules’ problems for my project.